A few preliminary words – for a more complete answer to the dressing specific side of these questions, please consult my last book, Dressing The Man. I say this because it deals in some detail with the type of what-to-wear questions posed here. Brooks Brothers carries their own specially-boxed edition and Ralph Lauren sells it in many of his stores. Okay, now that I have established myself as a certified self-promoter, let us begin. When it comes to wedding day fashion, there’s so much attention paid to the dress. Fashion-wise, what’s the guy’s role in all of this? Regardless of the occasion, I’m loath to recommend an ensemble or a style of dress that includes clothes whose design invites premature obsolescence. I feel it’s my responsibility to steer the groom away from the pitfalls of fashion’s more disposable byways and towards those with more proven footing. The wearer should be the ultimate arbiter of his clothes’ length of service, not time or fashion. All genuinely well-dressed men have wardrobes composed of clothes that have transcended fad and whim to become like old friends. Having said that, those sympathetic to the Thom Browne or fashion-at-all-cost plumage should likely pass on my dance card, as we’d be out of step from the first do-se-do. A man’s wedding day is likely to be not only his most important, but his most memorable photo opportunity to date. As such, he should try to put his best-tailored foot forward. Hopefully, decades and fashions later, he will show off his wedding pictures to his son or son-in-law having inspired them to set their style clock for distance rather than speed, or if really dialed in, both. The good news is that any man happening into well-designed formal duds is guaranteed high marks on the debonair and handsome scale. While few of today’s wedding corridors play host to this level of groom swellegence, top drawer formal wear comes with it’s own time-tested seal of perpetuity. Maybe that’s one reason that this last vestige of upper-class life has managed to hang around for so long. In spite of the fashion community’s seeming congenital need to de-fang the classic tuxedo’s perceived sameness, “the real deal” continues to deliver on its original promise of investing all comers with a Hollywood-esque, leading-man-like bearing. Unfortunately, I wish there was more encouraging news relative to unearthing these fashion-proof dress duds. While they do exist, the odds of finding them, no less donning them correctly, are steeped against you. Between today’s retail floors where fewer well-trained staff roam than at any time in menswear history, the paucity of public style-models, and the decades-long unraveling of high-class, time-honored taste, men intent on refining their dressing skills face an unprecedented force of counter-veiling winds. Reflecting the culture’s need for immediate gratification, industry antidotes abound; follow this designer, study this fashion magazine, shop with this retailer, hire this personal stylist, etc. Many are jealous of those who can afford someone do their shopping for them. I would argue that if anyone other than yourself is picking out your clothes, enduring personal style will always elude you. Like all self-tuning, skill-based learning curves, mastering your own style is not something that can be purchased; it must be lived. For those interested in reading themselves towards higher-brow terrain, periodicals like The Rake or France’s Monsieur Magazine should be at the top of the list. Style advice columnists like Glenn O’Brian or Bruce Boyer should likewise be at arm’s length. And if you can hunt down the whereabouts of a library or private person’s collection of pre-1960 Apparel Arts, Esquire, or Adam fashion magazines, you’ll have unearthed the mother load of all truth-in-timeless male taste and fashion. To conclude, nothing of any importance or lasting value has ever been accomplished without a commensurate degree of personal ownership and resolve. Dressing well is a skill that can be taught and learned. Contrary to popular opinion, personal style is not something you are necessarily born with nor does one mystically imbibe it from the atmosphere. Learning to choose clothes wisely and wear them with some imagination is actually much simpler than commonly thought – what makes it complicated is gaining access to the correct information on a person-to-person basis. 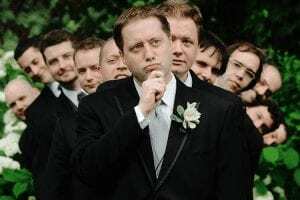 So what’s the biggest mistake grooms make relative to dressing for their wedding day – first, taking responsibility to learn enough to be able to make good choices for themselves and second, relying too heavily on those whose lack of expertise is often confused with their desire to be helpful. Basically you are asking about something akin to fashion-victim insurance. 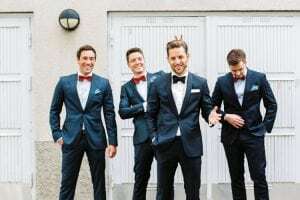 How does the groomsman free himself from the specter of ending up as one more fashion victim. Again, there can be no substitute for old-fashioned initiative and self-reliance. And how this translates into the realm of personal raiment is by gaining mastery over the two lynchpins that govern long-term personal style – proportion and color. Regardless which trends happen to rule the day, season, or time, as long as you wear clothes whose proportions complement your body and colors that enrich your complexion, you will always look in-the-know and up-to-date. Presumably, you’ve dressed a lot of grooms in your time. What’s the most unusual/weirdest day look you’ve seen on a groom? Any funny stories you can share? Any particular trends in groom style you are loving (or hating) right now? Like watching a train wreck, I can’t take my eyes off the annual Oscar night mash-up between what remains of American male style literacy and that which masquerades as Red Carpet peacockery. The occasion never fails to assemble a cross-section of the oddest mantled men, most of whom look as if their clothes were trying them out for size. If one needs a reminder of how far this new-age fashion frontier has strayed from Hollywood’s halcyon days of home-grown, movie-star glamour, this yearly parade rarely disappoints. With the impressionable male celebs costumed by the latest cadre of red carpet specialists, the get-ups pay homage to borrowed fashion as a cautionary tale. Those who ask others to do their sartorial bidding typically end up looking as if the clothes rented them. Here’s one of the Red Carpet’s more amusing fashion trysts. 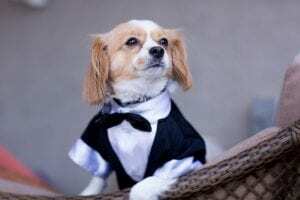 Five or so years ago, substituting the long tie for the bow tie seemed like a stylists’ dream, shaking up the tuxedo-wearing establishment while distancing their clients from the bow-tying hoi polloi. That the tie’s length covered the evening shirt’s bejeweled front contravening both function and form while dumbing-down its distinctive stature was of secondary importance. Then, as the four-in-hand began to insinuate itself as the new norm, its widening appeal obliged it to implode, courtesy of its eviscerated exclusiveness. And in true fashion irony, the long tie’s proponents beat a hasty retreat back to the formerly maligned, but now fully pardoned, bow. For those seeking the sartorial grail, these episodic flights of contrived fancy are what everyone has come to expect from the trend subservient business of fashion. In some circles, these excursions entertain, eliciting bemused mirth; in others, they are taken as gospel, squiring multitudes around yet another lap of fast fashion’s ceaseless pursuit of the future-perfect tense. Too many victims, not enough victors……the battle continues!